The following article explains how to add a new domain alias to a SmarterMail account. A domain alias is an additional domain name that is configured for an existing email account. For example, if domainname.com is the name of the mail account, domainname.org can be added as a domain alias. Messages sent to domainname.org will be delivered to the domainname.com email account. 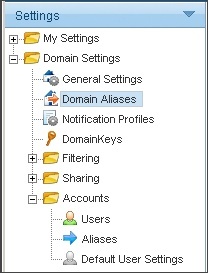 From the left side bar, expand Domain Settings and click Domain Aliases. Enter the domain name alias.